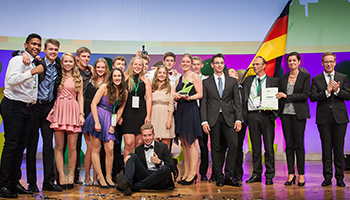 Each year JA Europe gathers distinguished partners to help select some of the top mini-companies during the competition. Each award is deliberated on by a special Signature Award Jury. The Citi Foundation Client Focus Award will recognize student enterprises that excel at creating value for their clients, listening to their clients and walking in their shoes to understand their world, anticipating and serving their changing needs. Delta’s Innovation Award will be given to the student company which: has an innovative or effective approach for solving a problem or developing further a product, their idea has a potential to prosper and has an international prospect; their idea is easy to implement and has a functional business model. FedEx believes entrepreneurs help build connections that can power the world. Because the company also believe a more connected world is a better world, they proudly support global entrepreneurship education. The FedEx Access Award recognizes student-run businesses that best exhibit the principles of global connectivity. The ManpowerGroup "Ready for Work" Award recognizes those teams that have best built work readiness skills during the competition. In 2017, ManpowerGroup will be presenting the award for the project that makes most significant impact on developing learnability, a key component of work readiness.